When the wall between the refrigerator and freezer is hot. There is a couple of things that usually causes this. First you might have to clean the condenser. Depending on the model of your refrigerator it might be located in the front bottom behind your kick plate. Remove the kick plate and check and clean if necessary. 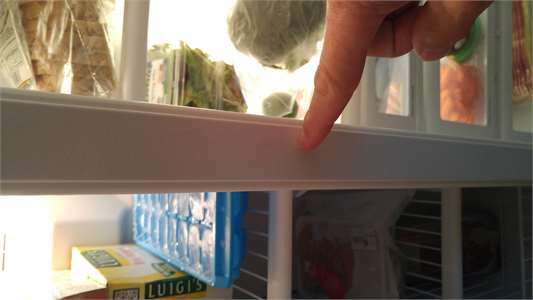 If it is not there you have to pull the refrigerator out and remove the back panel. You will see the condenser there. I like to use a vacuum to remove as much dust and pet hair as possible. The other reason it is hot because your condenser fan motor is not working. You will have to pull your refrigerator out and remove the back panel. You will see a small fan. Make sure refrigerator is on, this fan must be turning whenever your compressor is on. If ether your condenser is clogged our your fan is not turning this will cause your freezer and refrigerator not to cool correctly. Your ice maker has a thermostat built in. The temperature of your freezer must be below 10 degrees for it to start producing ice. Check these thing out and it sounds like it will start working properly for you. So when the wall between the refrigerator and freezer is hot and if your in the Dallas or Plano Texas area and would like us to take care of this or you Just click the link below and give us a call.